Park St Accommodation is located in sunny Bellerive just a short stroll (50m) to Blundstone Arena, watch cricketers training from your house. (100m) to beaches, walking and bike tracks and the new All abilities playground. Just a 5 minute walk into Bellerive Village to the many Cafe's and restaurants, bakery, PO and 5 minute drive to Eastlands Shopping Centre. Park St Accommodation is just a 10 minute drive into the city, 20 minutes to the airport and a 100m walk to bus stops. The property has four bedrooms and two bathrooms and sleeps up to 8 which is perfect for two families. The bedrooms consist of 2 Queen rooms , the third has bunks and fourth is a single bed. We have a single foldaway bed if needed also. Two bathrooms one with a walk in shower, the second has the laundry, shower, second toilet and washing machine. The kitchen is fully equipped with oven, fridge, microwave, induction cooktop and dishwasher. The sunny outdoor area has a BBQ, dining table and lounge. We enjoyed our stay in this recently renovated, immaculately clean house, steps away from the beach and excellent children's park. 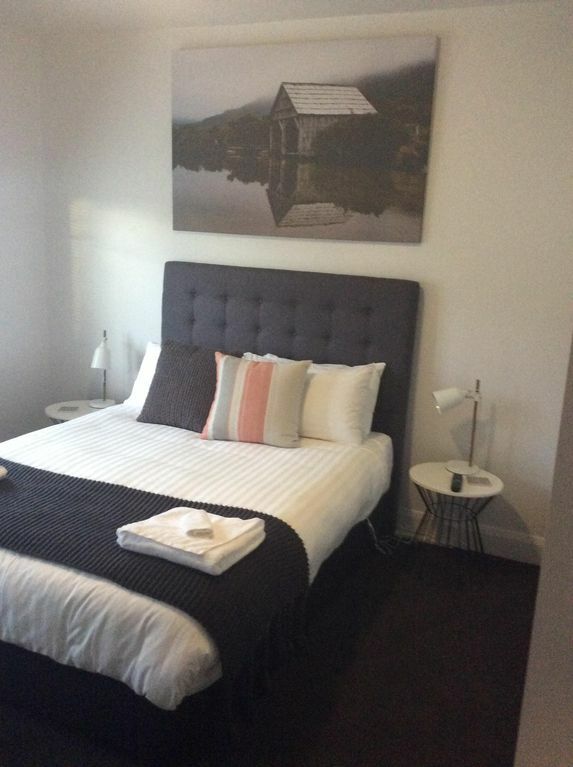 The House is located very close to Blundstone Arena and a short walk to the pretty village of Bellerive, with some good restaurants. The house has 4 bedrooms, two doubles with very comfortable beds and lovely linen. The fourth bedroom only a small single room and the third with set of bunks. Good storage in all rooms. The kitchen is well appointed with plenty of crockery, cutlery and utensils. The second bathroom is located within the laundry at the back of the house. The living/dining area is very spacious. One of our group has limited mobility, so this single level house with ramp access at the rear was well suited. Being an older style floor plan there is no toilet in the front section of the house, which might be a problem for an elderly person. Peter, our host lives in the property behind, and was very prompt in replying to our emails re arrival, keys etc..
Well presented home great for our family trip away. Ideal location close to cafes, playgrounds and beach. It was very clean. Close to shopping centre. We were impressed by the cleanliness of the house. Kids enjoyed staying at the place. They also had the opportunity to take photos of the sunrise on the beach. Great place to stay for my extended family. The place was big enough to accommodate my extended family and I. Located close to a beach and park that which was great for the kids and parents alike. Overall thought the property was well presented. The property was very clean and well presented. Communication with the owner was excellent.